SATAWAL, Micronesia » Thirty-two years after a historic 1976 Hawaii-Tahiti canoe voyage, five Polynesians were inducted today as master navigators into a sacred brotherhood of Micronesian wayfinders. 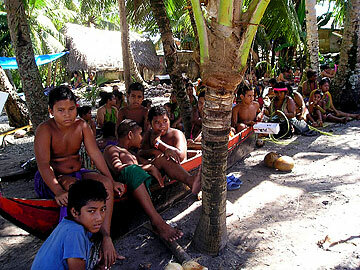 The induction into "Pwo" was the first time that Polynesians have joined a select school of wayfinders from Micronesia. Native Hawaiians inducted as Pwo, or master navigators, were Nainoa Thompson, Shorty Bertelmann, Bruce Blankenfeld, Chadd Paishon and Chad Babayan. "Today was not about us. Today was about our children continuing their tradition, culture and ancestry," Thompson said. "I'm honored, but it's also the realization that with this entitlement, you hold the stewardship of an art, which is a big responsibility," said Babayan, a master navigator and teacher of a Hawaiian-language-based program on the Big Island. With the rubbing of herbs on the head and the chest, the inductees were reminded that navigation requires the mind as well as the heart of someone with the qualities of humility, leadership, courage and kindness. The ceremony in a men's house under thatched coconut leaves represented the culmination of a cultural exchange that began in 1976 when Micronesian Mau Piailug used his native wayfinding skills to guide the Hawaiian double-hulled canoe Hokule'a on a Hawaii-Tahiti voyage of more than 2,200 miles. The voyage to Tahiti supported the assertion that centuries before Europeans, Polynesians were making ocean journeys using their understanding of signs of nature, including the stars, clouds, waves and birds. Piailug, 76, has said that by sharing his skills, he was laying a stick connecting Polynesia and Micronesia, with the hope that one day, native Hawaiians would help his native Satawal in continuing its then-tenuous tradition of ocean voyaging. Thirty-two years ago, Hawaiians and their supporters built a double-hulled canoe, but their wayfinding skills had been lost centuries ago. The 1976 Hawaii-Tahiti journey sparked a renaissance in Polynesia that resulted in the building of more than 16 voyaging canoes. Under the teachings of Piailug, the Hokule'a has traveled across the Polynesian triangle from Hawaii to Rapa Nui (Easter Island) to Aotearoa (New Zealand) and sailed distances equaling twice around the world. The Pwo ceremony was vindication for Piailug, who has been criticized by some Micronesians for sharing his wayfinding knowledge outside his culture. 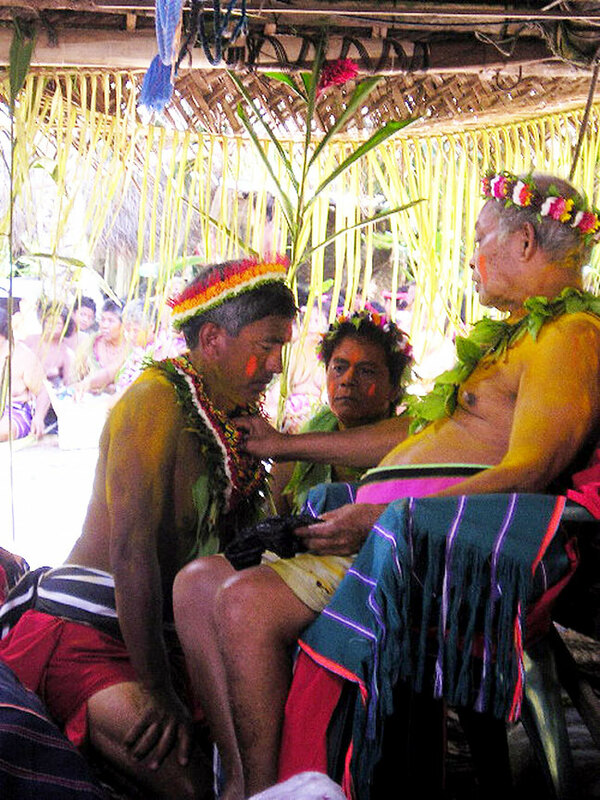 Thompson said the Pwo ceremony was the first on Satawal in 50 years. 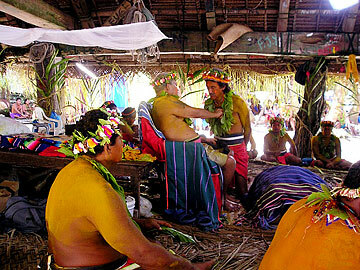 Sixteen people were inducted, an indication of a revival of the navigation tradition in this region. "Everybody is behind stopping the erosion and extinction of a great tradition," Thompson said. The crews of the Hokule'a and Alingano Maisu traveled more than 3,500 miles to reach this tiny island. Their mission was to honor Piailug and present him with the double-hulled canoe Alingano Maisu as a gift for his contribution to the renaissance of wayfinding navigation. On board the Maisu were several Satawal crew members, including Piailug's son, Sesario Sewralur, who was also inducted into Pwo. Mau, who as a navigator emeritus is a couple of levels above Pwo in the Weriyeng School of Navigation, conducted the ceremony at about noon today (yesterday in Hawaii) on the shores of his home island, a mile-by-half-mile stretch of coral and sand topped by a canopy of coconut and breadfruit trees. Although not of chiefly ancestry, Piailug, who has built many canoes on Satawal, is respected for his continuing role of providing fish and other seafood to his home island. The delivery of the Alingano Maisu is the fulfillment of a promise made five years ago by the late Big Island resident Clay Bertelmann to build a canoe for Piailug. Paishon said more than a thousand people contributed to the building of the Alingano Maisu and its delivery was made possible by them.